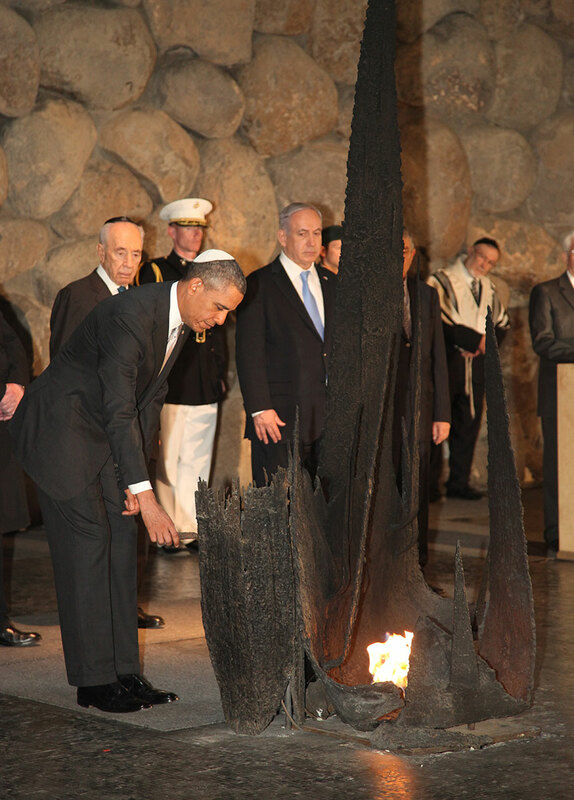 US President Barack Obama will visit Yad Vashem on Friday, March 22, 2013. He will visit the Hall of Names, the Museum of Holocaust Art, participate in a memorial ceremony in the Hall of Remembrance, and visit the Children’s Memorial, before signing the Yad Vashem Guest Book. 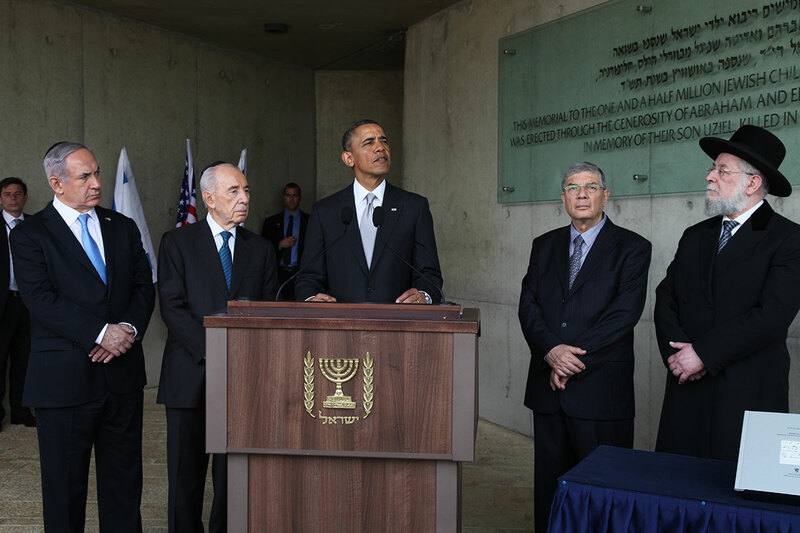 President Obama will be accompanied by President Shimon Peres, Prime Minister Benjamin Netanyahu, Chairman of the Yad Vashem Directorate Avner Shalev and Chairman of the Yad Vashem Council Rabbi Israel Meir Lau. 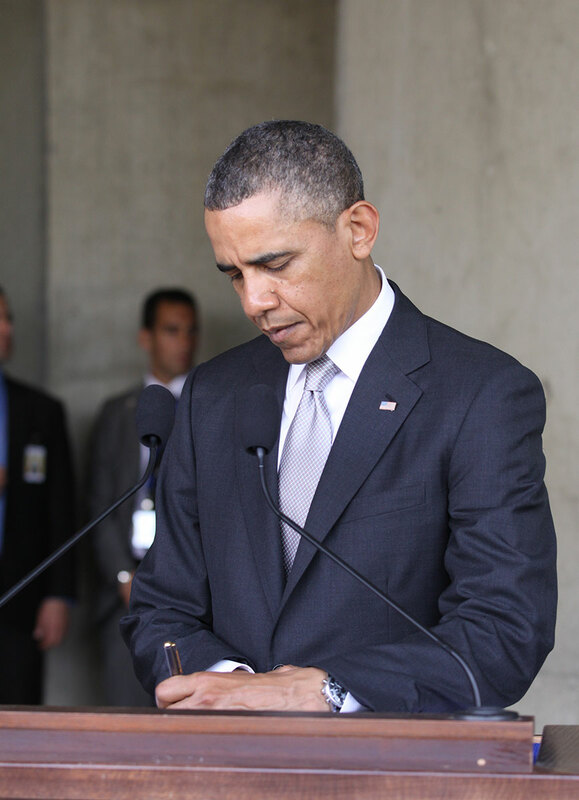 During the President’s previous visit, in July 2008, he toured the Holocaust History Museum. Yad Vashem, the Holocaust Martyrs’ and Heroes' Remembrance Authority, was established 60 years ago by the Knesset, Israel’s Parliament, in 1953. Located in Jerusalem, it is dedicated to Holocaust remembrance, documentation, research and education. Through its International School for Holocaust Studies, International Institute for Holocaust Research, Archives, Museums and Library, Yad Vashem has become the global center for gathering and disseminating information about the Holocaust. Since its inception, Yad Vashem (literally, “a memorial and a name”) has dedicated itself to recovering the names and identities of every Jewish person murdered in the Holocaust. Thus far, over 4.2 million individuals have been identified. This information is recorded in the Hall of Names. The names are gleaned from Pages of Testimony in memory of the victims that line the walls in the Hall, as well as from archival material. The domed ceiling is composed of hundreds of photographs of the victims, and empty shelves along the walls symbolize those victims who still remain anonymous. Efforts continue to identify and record the names of as many of the 6 million Jews murdered in the Holocaust as possible. The Names Database, with a sophisticated search engine, is accessible in English, Russian, German, Spanish and Hebrew at www.yadvashem.org. One of the Jews memorialized in the Hall of Names is Cantor Israel Eljasz Maroko, the Chief Cantor of Amsterdam. In 1956, a Page of Testimony was submitted by his son, Simon-Wolf. Based on information in Yad Vashem’s Archives, it was learned that on July 20, 1943 Israel Eljasz was deported from the Westerbork transit camp in Holland to the Sobibor extermination camp in Poland, where he was murdered three days later. His wife Rajsel and their children Hersz (Herman), Sara-Golda and Miriam (Marjem) were also murdered. Close to 6 decades later, in 2012, responding to the Yad Vashem “Gathering the Fragments” campaign, Maroko’s daughter-in-law, (Simon-Wolf’s widow) Ruth, of Sylvan Lake, Michigan, donated photos of Cantor Maroko, along with the handwritten sheet music of an original composition that Cantor Maroko wrote to the Passover liturgal poem, Had Gadya, in Nazi-occupied Amsterdam in 1941. Of the many cantorial works he composed, this is the only one that survived the Holocaust. A token of remembrance with a copy of the sheet music, photos and the Page of Testimony will be presented to President Obama at the conclusion of his visit. Rare pre-war footage of the Cantor in the main synagogue of Amsterdam is viewable in the Yad Vashem Archives film collection. The Museum of Holocaust Art is a permanent display of art created during the Holocaust – in hiding, in the ghettos, in the camps, and even as forced labor – with short biographical details of the artists. Most of the artists did not survive the Holocaust and the museum is a testament to the human spirit that even in the most terrible conditions would not die. One of the unique collections in the Museum are works by Charlotte Salomon, a young Jewish German artist who left Germany to southern France in 1939, and found refuge at the home of Ottilie Moore. An American expatriate, Moore, was eventually able to evacuate 10 children with her to the United States. Unfortunately, Charlotte was not among them. In 1943, Charlotte and her husband Alexander Nagler were arrested by the Gestapo and deported to Auschwitz, where Charlotte, pregnant, was immediately murdered. Alexander died a few months later. Charlotte’s artwork survived, and some of the pieces are now on display in the Museum of Holocaust Art. The Hall of Remembrance was the first Holocaust commemoration site established at Yad Vashem on the Mount of Remembrance. Its walls are made of basalt boulders brought from the area surrounding the Sea of Galilee, and its angular roof gives it a tent-like shape. Engraved on the mosaic floor are the names of 22 Nazi murder sites, symbolic of the hundreds of extermination and concentration camps, transit camps and killing sites that existed throughout Europe. The Eternal Flame continuously illuminates the Hall, its smoke exiting the building through an opening at the highest point of the ceiling. 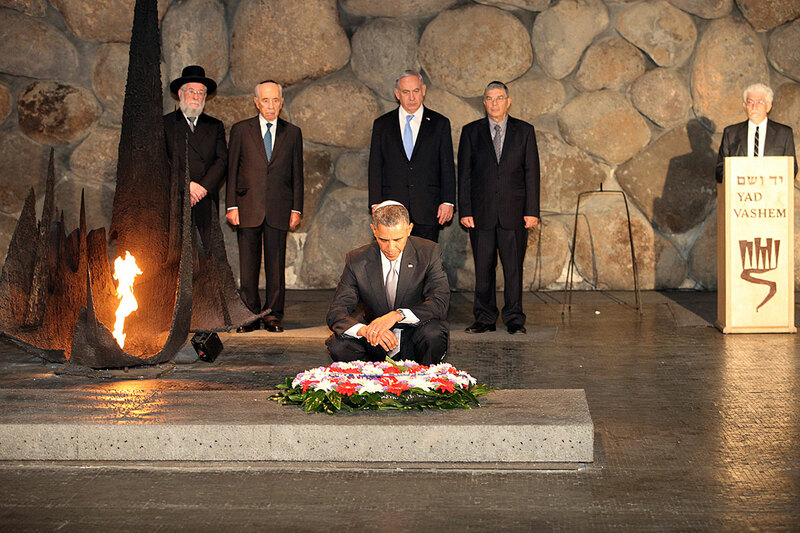 Before it stands a stone crypt containing the ashes of Holocaust victims, upon which the President will lay a wreath, after rekindling the Eternal Flame. The Children’s Memorial is the memorial to the 1.5 million Jewish children murdered in the Holocaust. In the underground chamber candles are reflected in countless points of light while the names, ages and hometowns of children who were murdered are read out in Hebrew, English and Yiddish. 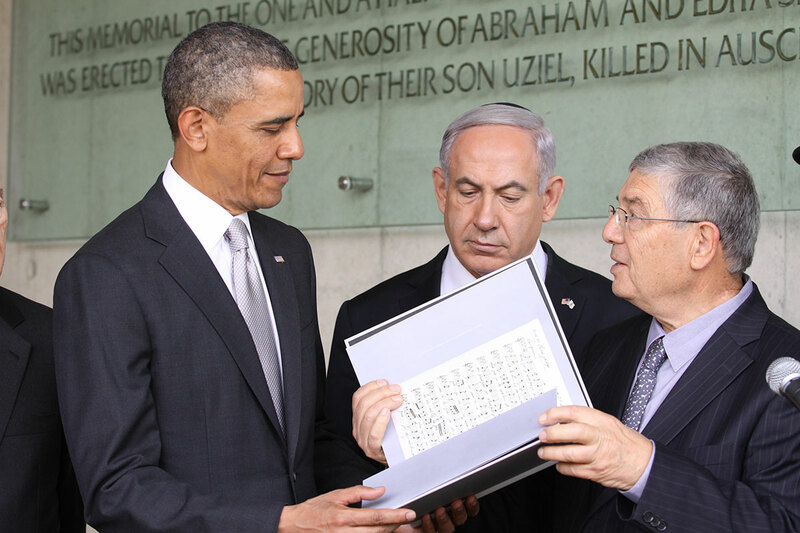 At the conclusion of the visit, President Obama will be invited to sign the Yad Vashem guest book. 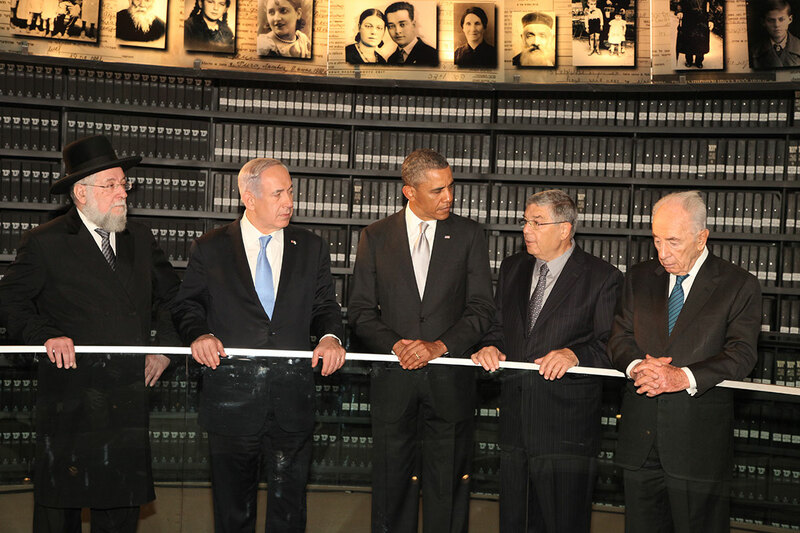 From Left: Rabbi Israel Meir Lau, Chairman of the Yad Vashem Council, Prime Minister Benjamin Netanyahu, President Barack Obama, Mr. Avner Shalev, Chairman of the Yad Vashem Directorate and President Shimon Peres. 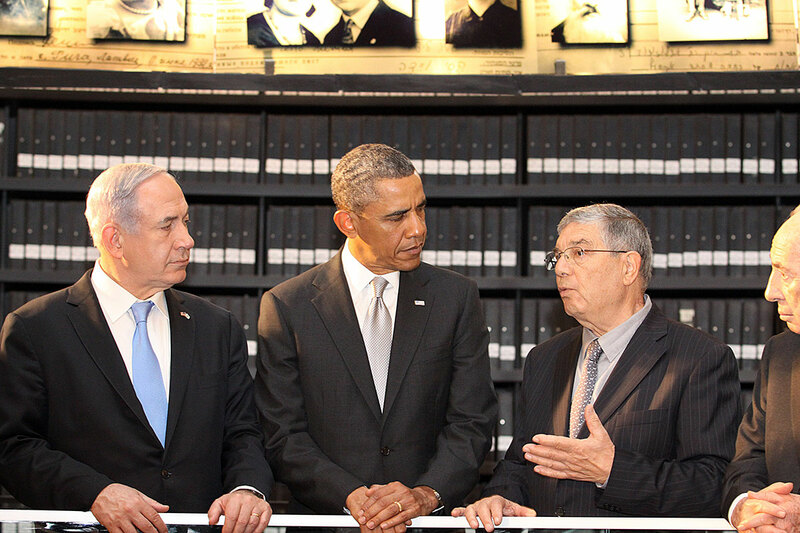 From Left: Prime Minister Benjamin Netanyahu, President Barack Obama, Mr. Avner Shalev, Chairman of the Yad Vashem Directorate and President Shimon Peres. 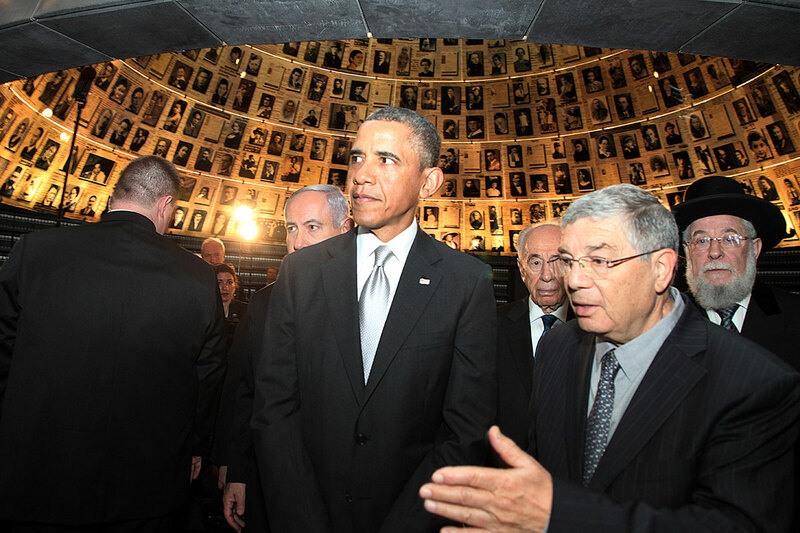 President Barack Obama and Chairman of the Yad Vashem Directorate Mr. Avner Shalev, upon exiting the Hall of Names. They are standing on the porch at the exit of the Holocaust History Museum. 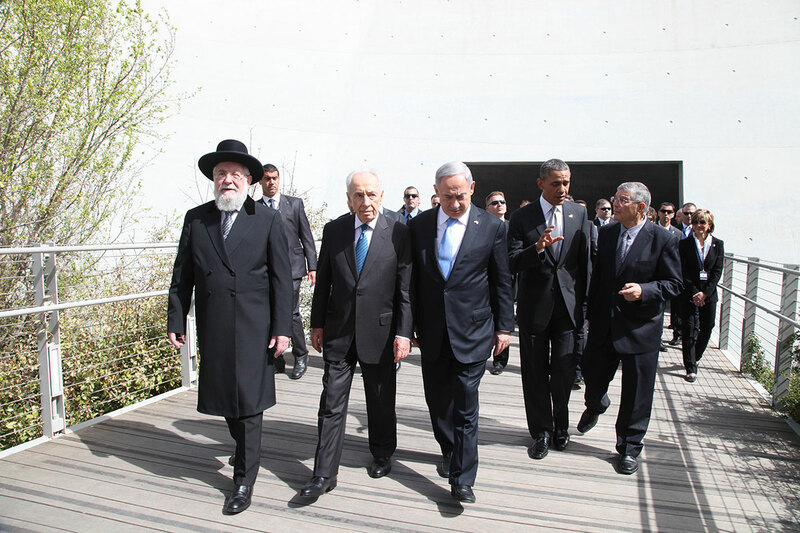 &nbsp;In the background (from right): Mr. Avner Shalev, Chairman of the Yad Vashem Directorate; Prime Minister Benjamin Netanyahu; President Shimon Peres, and&nbsp;Rabbi Israel Meir Lau, Chairman of the Yad Vashem Council. 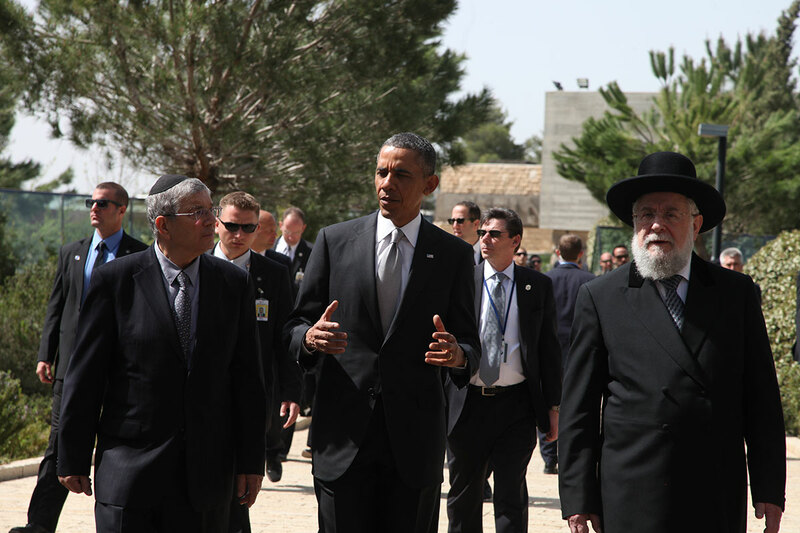 President Barack Obama, the Chairman of the Yad Vashem Directorate Avner Shalev (left) and Chairman of the Yad Vashem Council Rabbi Israel Meir Lau after leaving the Hall of Remembrance. 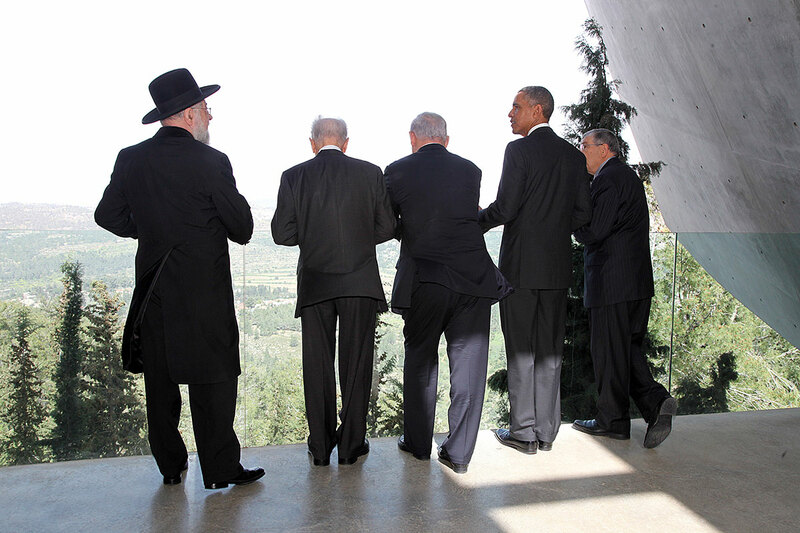 Accompanying him, (from left): Prime Minister Benjamin Netanyahu, President Shimon Peres, Chairman of the Yad Vashem Directorate Avner Shalev, Chairman of the Yad Vashem Council Rabbi Israel Meir Lau.